An unexpurgated heritage: the chapel of the Armenian Patriarchate in Istanbul. Flickr / John Lubbock. Some rights reserved. With the centenary of the onset of the Armenian genocide less than two months away, the economically aggrandising but politically repressive Turkish state needs to take stock—for the sake of its international relations as well as its domestic rapport with its minority communities. Although many Turks now accept that hundreds of thousands of Armenians, Assyrians and Greeks were massacred during the first world war, their government is increasingly unwilling to negotiate with Armenia to establish diplomatic relations and reopen the land border. Reconciliation is a low priority as the executive seeks to increase its authority over the remaining semi-independent state institutions, like the central bank and the judiciary. In the run-up to important elections in June, the ruling AK Party cannot afford to alienate its base of nationalistic, religious Turks or divert its attention from the Kurdish peace process—around 3.5m Kurds vote for it. The plan which the Turkish president, Recep Tayyip Erdoğan, seems to have formulated to deal with the awkward genocide anniversary is to ignore it completely. The commemoration of the Battle of Gallipoli, in which the Ottoman army halted the Allied invasion, has been moved from the usual date of 18 April to 24 April—the day the genocide is marked annually. Erdoğan even invited the Armenian president, among other world leaders, to the Gallipoli observances. Zaman, the opposition media group influenced by the Cemaat movement of Erdoğan’s ally-turned-rival Fethullah Gülen, reported that so few foreign leaders had accepted the offer to attend that the event was being cancelled. This is likely to be an exaggeration, intended to make Erdoğan look bad, but it seems to reflect Turkey’s increasing political isolation. One country Turkey does count as a close ally, Azerbaijan, is more important than any European validation, due to its natural gas reserves and ethnically Turkic population. It is the conflict between Azerbaijan and Armenia which seems to be the biggest obstacle in Armenian-Turkish relations, though Turkey could be using Azerbaijan as an excuse. While hostilities between Armenia and Azerbaijan over the disputed Nagorno-Karabakh region ended in 1994, tensions have never been resolved and there are periodic border clashes. Last year, the Azerbaijani president, Ilham Aliyev, went on a long Twitter rant about the strength of his army after some of its soldiers had been killed. The emotive nature of the genocide lends itself to political posturing and exaggeration of all kinds. Armenian media are reporting that Turkey paid the Muslim Brotherhood in Egypt to destroy ‘Armenian genocide documents kept at an institute’—which it’s very unlikely Egypt would have had in the first place. In Turkey, there are still extreme nationalist groups willing to display banners praising their ancestors for the ‘cleansing’ of 1915. Erdoğan maintains that an ‘impartial board of historians’ should decide if the Ottoman authorities were guilty at all. A number of diaspora groups and some Armenian parties are demanding that Turkey provide compensation—including all of ‘Western Armenia’, in what is now eastern Turkey. Western, or ‘Wilsonian’, Armenia was granted to the latter in the Treaty of Sevres, which partitioned the Ottoman Empire and large parts of Anatolia among the victorious allies in 1920. Its terms were seen as vindictive and spurred a nationalist rebellion, led by Mustafa Kemal Atatürk, which ejected the occupying forces of Britain, Greece and Italy. The treaty was largely unratified and unimplemented, and was replaced by the Treaty of Lausanne in 1923. The 1920 treaty has given rise to a reflex in Turkish politics so common it has a name: Sevres Syndrome. This manifests itself as a paranoia that outside forces are conspiring against Turkey. Armenian groups demanding that Turkey voluntarily cede territory play perfectly into this fear. In 2009 a provisional roadmap towards restarting a diplomatic relationship and reopening the border was announced by the two countries, but progress stalled and Armenia withdrew, saying Turkey was imposing preconditions such as a deal with Azerbaijan on Nagorno-Karabakh and the dropping of territorial claims. Armenia has however never officially demanded territorial reparations, though groups like the ARF and Armenia’s prosecutor general have done so. 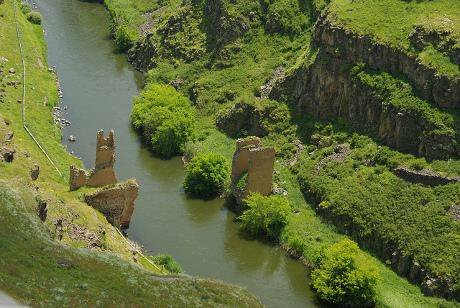 Still at a distance: a broken bridge between Turkey and Armenia. Flickr / Martin Lopatka. Some rights reserved. Both states look on the complex issue of compensation legalistically. Turkey is intent on securing a legal declaration from Armenia that it does not seek any Turkish territory, while Armenians, many of whose families had property confiscated during the genocide, insist on legal compensation for their losses. What Armenian groups like the ARF are effectively saying is that they are insulted that Turkey wants them to drop legal claims to material compensation—and that that is exactly why they are going to keep making them. While Erdoğan took the unprecedented step in 2014 of offering ‘condolences’ to the families of those killed in 1915, the government is reluctant to offer a formal apology. This stems partly from fear that it could be used to support claims for reparations—similar to the reticence of the British Foreign Office about apologising for colonial-era crimes. A final strand to the complex interplay of national groups within Anatolia and the wider region is the pro-Kurdish HDP, now the only serious left-wing party in Turkey. It has a female as well as a male leader but the latter, Selahattin Demirtaş, is undoubtedly more prominent. He is a respected figure with undeniable charisma, in stark contrast to the old-fashioned and uninspiring leadership of the secular-nationalist (now social-democratic) CHP, founded by Ataturk. From my conversations with leftist Turks, Armenians and Kurds in Istanbul, the HDP is seen as the only promising trend in Turkish politics. Many wealthier Armenians and Kurds vote for Erdoğan’s AKP but those of a more liberal disposition like what the HDP is saying. They hope that, by pushing its support above 10% in June, they will prevent the AKP from winning the 330 seats it needs to pass constitutional amendments giving Erdoğan even more power. This could be a risky strategy, as falling short of the 10% threshold would see the HDP win no seats at all. The HDP is sponsoring reconciliation projects in eastern Turkey; allowing Armenian churches to be rebuilt and conferences to be held. A new generation of Kurds are talking about the historical guilt felt by the descendants of those who participated in massacres, only to be subsequently persecuted by the Turkish state themselves. Projects such as these, and the social progress promised by the HDP in the areas it administers, offer the best prospect of reconciliation between the Turkish state and its minorities. Armenians in Istanbul live today much as their ancestors did in the 19th century—economically, socially and culturally integrated in Turkish society. Unless they were to broadcast their ethnic affiliation, nobody would know they were part of any minority, as the ethnic mix of those who today call themselves ‘Turks’ is drawn from all over the former Ottoman Empire. “Happy is the one who says ‘I am a Turk’,” said Atatürk, but the reality was that thousands who were not Turks simply kept silent about the fact. 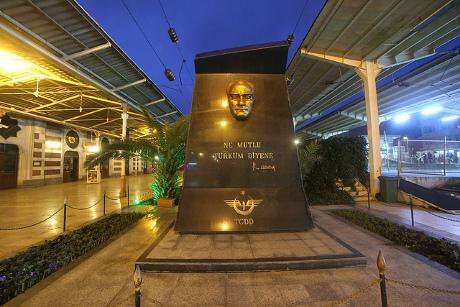 Happy to be a Turk: a memorial to Atatürk in Istanbul with his famous slogan. Flickr / John Lubbock. Some rights reserved. The AKP’s rise to power and its removal of the old Kemalist power structures in the military, government and education was associated with a period of relative freedom of expression in Turkey. Although the authorities attempted to prosecute Orhan Pamuk, the Nobel Prize winning author, for recognising the genocide in 2005, the charges were eventually dropped. Once the AKP was fully in control, however, it found that it quite liked being in charge. Life has remained difficult for journalists in Turkey, particularly if they are from a minority. If the government continues its slide into ‘competitive authoritarianism’, things will get worse for poorer Kurds, Alevis, Armenians, Jews and members of other minorities. The undercurrent of hatred created by the unresolved historical question continues to create violence, such as the murder of the Armenian Turkish journalist Hrant Dink in 2007, who was being prosecuted for ‘insulting Turkishness’. His crime, ironically, was to appeal to Armenians to let go of their demand for Turkey to confess its historical guilt, to “replace the poisoned blood associated with the Turk, with fresh blood associated with Armenia”. This statement was read by extreme Turkish nationalists as suggesting that Turkish blood was somehow dirty and probably inspired those who commissioned his murder. But his words still stand: both sides must let go of their hatred if there is to be any progress. 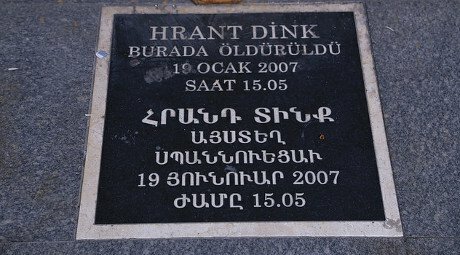 Remembering Hrant Dink: a plaque in Istanbul. Flickr / John Lubbock. Some rights reserved. The centenary of the Armenian genocide is a milestone, to be sure, but it will have little impact on the political direction of the Turkish and Armenian states. If anything, the emotional significance of the anniversary seems to have pushed any possible diplomatic reconciliation further away. On 24 April in Yerevan, System of a Down, the famous Armenian-American rock band, will play to a crowd including thousands of diaspora Armenians who will be travelling to the country for the first time. They will find an impoverished country in an unstable region, with thousands of new Armenian refugees from the Syria conflict. Meanwhile, in Çanakkale, the nearest town to the site of the Battle of Gallipoli, as well as the historical site of ancient Troy, Turkish officials will be remembering how their ancestors bravely fought off the invading allies, while in the provinces Turkey’s minorities were being systematically liquidated. 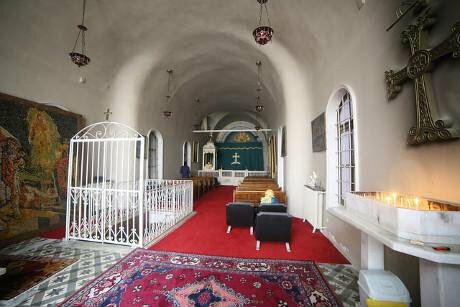 Away from the international posturing, though, in the newly reconstructed Armenian church of Sourp Giragos in Diyarbakir, eastern Turkey, Armenians and Kurds will hold a remembrance service likely to be attended by many of Turkey’s ‘hidden Armenians’. While the government’s history books still deny that the events of 1915 amount to a genocide, many of the younger generation are looking again at their national mythology and concluding that Turkey is no longer the victim of Western political meddling—but an economic powerhouse which could use its influence to bring greater stability to a troubled region.